Why a windscreen? Well, whether you have an alcohol or Esbit burner under your pot, the wind can interfere with the heat of your burner getting to your pot, and even blow out the burner flame if it's strong enough. Get yourself one of my everlasting 0.10mm thick titanium windscreens and you'll heat your pot faster with less fuel. If you use the same pot with different kinds of stoves, it may be possible to have one windscreen that works with all of them. In terms of size, you want to have a 3/8- to 1/2-inch gap all around your pot (the windscreen diameter should be 3/4 to 1 inch larger than your pot's diameter). If you have several pots, you can get windscreens that match each one, OR get one that fits the largest pot and use paper clips to adjust it for your smaller pots. If you have a really squat pot, I can trim the height of either a regular or TALL windscreen to your specifications. Just let me know what you need. See the video on this page for a demonstration of how it all works. A new option is a regular small windscreen with 1/4" trimmed off the height to fit the popular Toaks 550 pot perfectly. These windscreens also pair perfectly with my ULtimate Esbit System, and the small windscreen will fit on the FireFly stove tabs to be used with a backup alcohol burner and small pot. You may want to check out Sectionhiker's review. Maybe you already have an alcohol burner and pot support and just need a great windscreen. 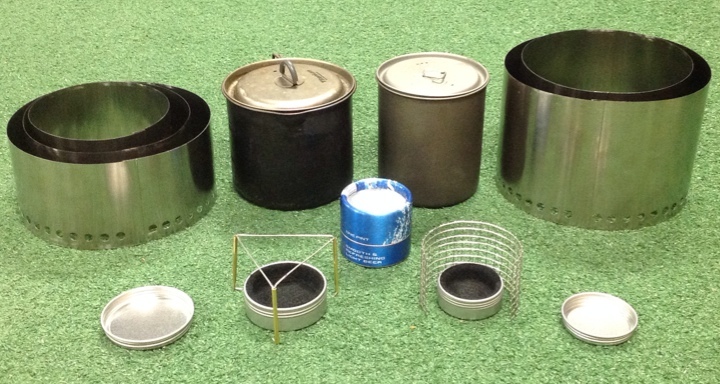 But if you need a burner, or you want to get a complete Kit including a pot, I've got those too. Just go check out my Burners & Pot Stands or my Complete Kits page. You will be charged $3.60 shipping for each windscreen. If you order more than one, I will refund the extra shipping costs that PayPal will add. No worries. If you add a a burner or pot stand to your order, I will also rebate the extra shipping, so that your total shipping cost will just be $3.60.